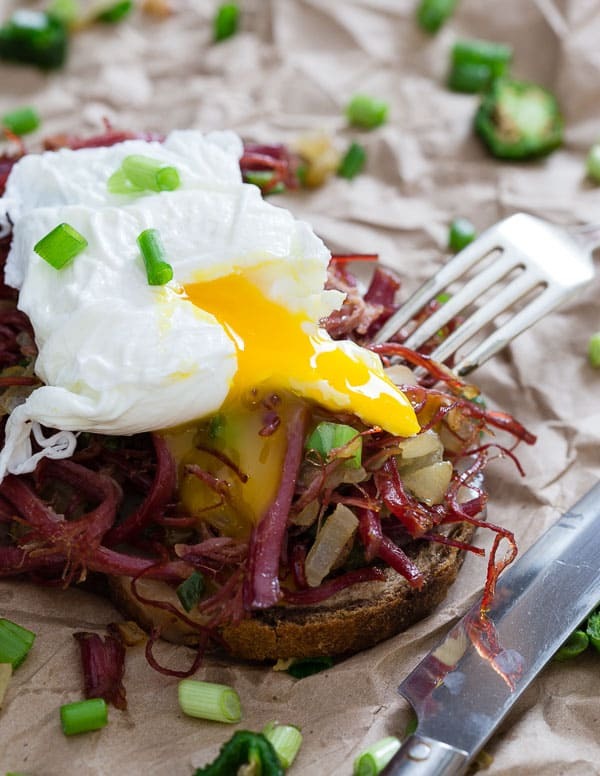 This corned beef hash breakfast sandwich with crispy rye bread, melted swiss and a poached egg is the perfect way to use up leftover St. Patrick’s Day corned beef. There is really only one redeeming thing about St. Patrick’s Day and that’s corned beef. Not corned beef and cabbage. Not artificially colored green EVERYTHING (if there’s one thing that gives the gross fake pink of Valentine’s Day a run for it’s money, it’s the fake green of St. Paddy’s Day). If you want to eat something green on St. Patrick’s Day, try this green oatmeal – it’s fun, festive and all natural! And certainly not Guinness (I want it to taste like the liquid chocolate it looks like and weirdly, it just never does). Corned beef, however, that I can get behind. This salty cured beef really has no business being cooked to mush for hours on end with cabbage. I’ll do some corned beef tacos, Reuben soup or just eat it plain but I will not eat boiled corned beef with soggy cabbage. But, if you’re going to do it anyway like the millions of people out there come March. 17th, at least do me this favor…make enough for leftovers. 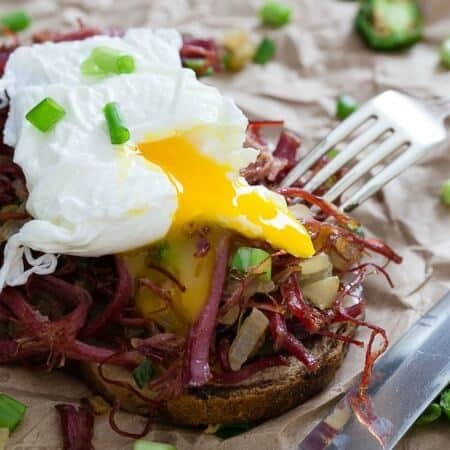 Then, shred those leftovers, crisp them up in a pan with some spicy jalapeno, throw them on top of a toasted slice of buttery marbled rye bread with melted swiss cheese, place a runny poached egg on top and call it a corned beef hash breakfast sandwich on March 18th. Because as evidenced in this harissa sweet potato hash and this kimchi potato hash, we all know hash is where it’s at for breakfast. Just please, dear G-d, leave the artificially green colored, pot-o-gold cupcakes out of the equation. 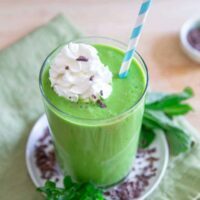 I’ll allow a real food version of a shamrock shake but that’s only because spinach and mint are doing the heavy lifting to turn it green, not food dye! Check out all St. Patrick's Day recipes below. There's everything from corned beef tacos to soda bread, Irish stout soup and boozy cheesecake dessert! 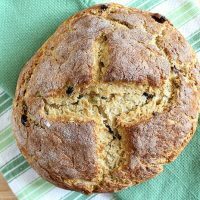 A sweet take on Irish soda bread, this cinnamon sugar soda bread is subtly sweet and perfect for breakfast! Celebrate St. Paddy's Day with a Mexican twist! 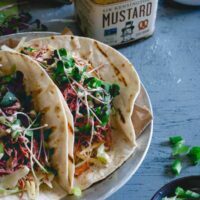 These corned beef tacos are a fun new way eat corned beef. A copycat version of McDonald's shamrock shake made healthier with real food ingredients and no artificial dyes. 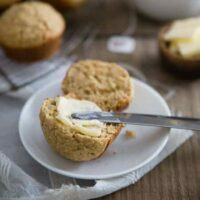 These Irish brown bread muffins have all the flavor of the traditional Irish bread in muffin form. Add the optional candied ginger for a nice subtle texture and bite. 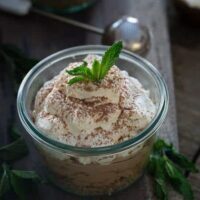 This easy no-bake cheesecake is chocolatey and boozy and the perfect St. Paddy's Day treat! This corned beef hash breakfast sandwich with crispy rye bread, melted swiss and a poached egg is the perfect way to use up leftover St. Patrick's Day corned beef. 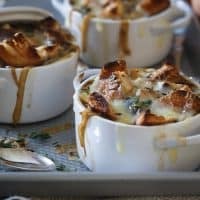 This gluten free Irish stout onion soup is made with buttery toasted thyme croutons and topped with plenty of Irish cheddar. Place the oil in a large skillet over medium heat. Once hot, add the onion and jalapeno and saute for 2 minutes until softened. Add the corned beef and continue cooking for another 3-5 minutes until it starts to crisp on the edges. Transfer to a plate and set aside. Butter one side of each piece of bread. Place each slice of swiss cheese onto the non-buttered side of each piece of bread and place in the skillet, buttered side down. Cover and cook until the cheese melts. Remove the bread from the skillet, place half of the corned beef mixture on top of each slice of bread. Poach (or fry) the eggs and place on top of each sandwich. Garnish with green onion and serve warm. I haven’t had breakfast yet and man does that runny egg look divine over that corned beef. 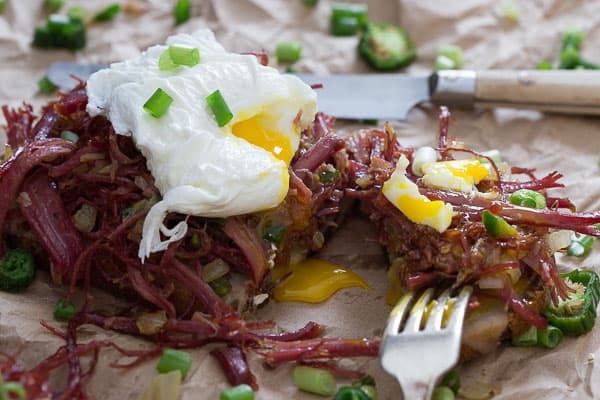 Ok, true confession I have never had corned beef hash. EVER! I’m a food blogger and officially ashamed I haven’t tried it yet. But seriously this dish with that egg.. yup… all over it! This is happening next week fo sho! Have mercy I’m hungry after seeing this! Love the egg to top it off! This is a sandwich I can totally get behind! LOVE corn beef hash! If only I had the time (and effort) to make this sandwich every morning! For me, it’s definitely a weekend breakfast and one I look forward to making this Saturday. Oh my gawd that EGG. Just finished dinner and I’m starving again. This looks delicious and the egg…THE EGG! The runny egg. The crispy corned beef. The rye bread. Perfect perfect perfect! This will be our first St. Patrick’s Day out of South Boston, where we lived for 9 years before buying our house. If we decided to stick around for the parade, we always had people over for brunch (and pre-gaming). I’m not one for food coloring either, but I’d pull out the green to color my green sangria. Totally silly… but, hey, it felt festive. And while I don’t eat meat, I can certainly appreciate the joys of corned beef… and on a breakfast sandwich, well, that would certainly be a good thing to consume before a day of drinking. I don’t think I’ve ever eaten a breakfast sandwich that looks this good! I could eat this every day for a long time. Looks mouth watering! I want one of these so bad right now! What a mouth watering breakfast delight, I simply can not get passed that poached egg dear, BEAUTIFUL. I just learned to poach eggs, after viewing this and I will be all over this morning treat.